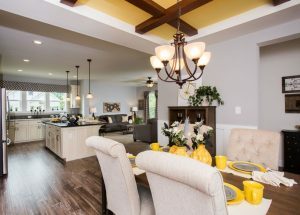 The R-Anell Summit series is designed to meet all or our customers’ wants and needs by allowing you the flexibility to pick and choose every aspect of their new home! 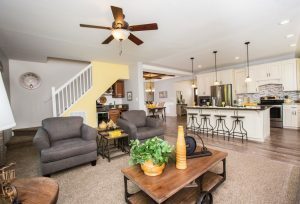 Our Summit series features the Baxter Ranch home which is a three bedroom and two bathroom ranch with an open concept floor plan. The exterior of the ranch has great curb appeal featuring a twin peak dormer, recessed entry way, and a flush dormer with a bump-out. The large recessed entry way opens into a spacious foyer with a guest closet and a great foyer wall for a nice entry table. The bedrooms are spaced across the whole home with the second bedroom off the foyer. As you pass through the foyer you are brought into the Kitchen and Dining space. The Dining room features a beautiful tray ceiling with cross beams giving this space definition and character, also our Craftsman Wainscot adds additional character to this beautiful southern home. Our dining room is open into the spacious and beautiful kitchen! The kitchen is a must see, with the gorgeous Chiffon Glazed Mission Cabinets, wall of windows and much more! The L-shaped kitchen boosts a great work flow with the island in the middle of the kitchen housing the sink and optional dishwasher, the stove and refrigerator behind the island, creating the perfect shape for the cook in the house. The kitchen opens into the large Living Room, the living room has 4 great windows that let the natural light in this gorgeous space. With a large endwall, it gives great design possibilities for the layout of the space. We also offer under the stair components, so the space underneath the stairs is not wasted space. In this model the optional beverage center is optioned in which features a beverage cooler, cabinetry both base and overhead, and a great prep and serving counter-top space. The Master Bedroom is off of the living room, and it features a large walk-in closet, and a great Master bathroom. The master bathroom features double sink vanity, a walk-in shower, and a soaker tub standard. This bathroom has some great optional layouts and showers, our model shows our ceramic tile shower with two glass sides, with our new 7”x 20” Emblem Gray shower tile! The two secondary bedrooms are separated by the living space with one bedroom off the foyer hallway and the other off the dining room hallway. The secondary bathroom is off the dining room hall as well, and features a tub/shower combo and a nice linen cabinet. The utility room is a space that houses the washer and dryer hookups and features a small family drop zone. 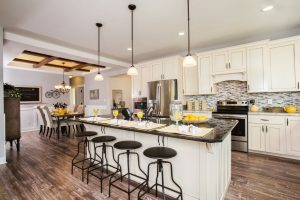 The living space in this home is the must see, especially this gorgeous Kitchen! This entry was posted in News on July 19, 2016 by hshearer@commodorehomes.com.